We’ve all been there: it’s late at night, you’ve had a few drinks, and you’re messing around with your iPhone. It slips out of your grip, smashes into the ground, and the screen shatters into a million pieces. Now, imagine doing the same thing with a phone made entirely of glass. A new Apple patent indicates this could soon be a reality, where all of us are carrying fragile little all-glass iPhones begging to be dropped. 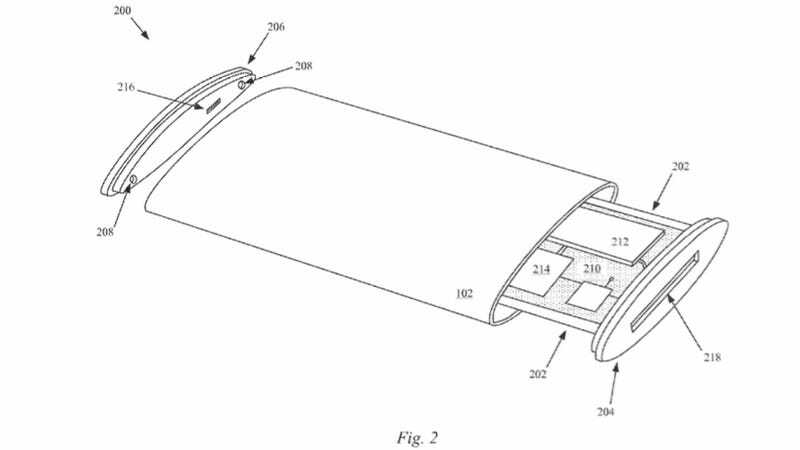 The patent reveals an iPhone design with a screen folded around the front and rear sides of the smartphone, enveloping the phone in a glass display. Why on earth anyone would ever want a phone with a display wrapping around the backside is anyone’s guess. It’s hard to imagine how anyone could possibly use both sides of their phone at the same time. Plus, it’s not like there’s a shortage of screen sizes to choose from anyway. If you need more display, simply get a larger phone maybe? The new iPhone Plus is so big it barely fits into most people’s pockets. If you need a bigger screen than that, you’re probably better off using a laptop. This isn’t the first time Apple has shown interest in creating a bezel-free iPhone, either. The company has already filed for dozens of patents that stretch the screen all the way to the iPhone’s edges. In this particular filing, several drawings show exactly how a smartphone with a screen that wraps around the edges of the body would look and operate. The pictures show a display covers the entire front and rear sides of the with phone, leaving only small bezels at the top and bottom. Although the patent was just granted today, it was first filed in 2011. Images in the all-glass iPhone patent show the device with a 30-pin connector rather than the new lightning connector that was released in 2012. If the iPhone eventually includes a screen on its backside, it wouldn’t be the first smartphone to do so. The YotaPhone generated a buzz when it launched in 2012 because it featured an e-ink display meant to help preserve the phone’s battery. Apple’s new patents, however, don’t clearly explain any immediate benefits from the wraparound screen aside from the fact that it provides more room to display text and images. Whether or not the all-glass iPhone will ever become a real product remains to be seen. It’s important to remember that not all patents turn into products, and when they are actually used for products, it usually takes years before people see a real device that they can buy. So, if you’re holding out for the next iPhone in hopes that it has a display wrapping around its entire body, my only advice to you is to give up hope. The all-glass iPhone probably isn’t coming anytime soon — and we pray that it will never see the light of day.